People who are distracted are even worse drivers than aggressive motorists and drunks, according to a AAA survey of drivers. From something as mundane as changing the radio station to as reckless as drinking and driving, a myriad of potentially dangerous actions take place on American roadways in a given day. Yet the most hazardous deed of all may be one most of the country has admittedly done. Distracted driving was deemed the top danger on the road by a vast majority of drivers surveyed by AAA for the company’s 2017 Traffic Safety Culture Index, an annual report cataloguing national behaviors and attitudes toward roadway safety. Eighty-eight percent of those surveyed named distracted driving as their most pressing concern, with the behavior far outweighing other unsafe actions, including aggressive driving, which 68% of participants named as a growing worry; drugged driving, which was mentioned by 55% of those surveyed; and drunk driving, which 43% said was a leading issue. It’s possible more Americans noted a mounting anxiety around distracted driving as many more have admitted to participating themselves. 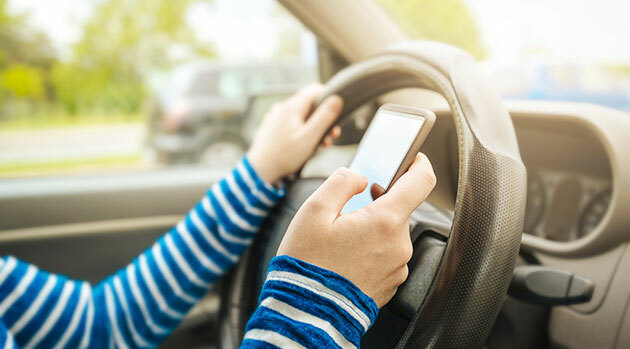 At 49%, nearly half of those surveyed said they recently talked on a cell phone while driving—marking a 46% jump in self-reported cell phone incidents since 2013—while an additional 35% copped to sending a text or e-mail from behind the wheel. In a moment of cognitive dissonance, the same survey participants named placing calls and sending texts while driving as serious threats to personal safety—at 58% and 78%, respectively. Still, the number of fatalities on the road increased in 2016 for the second consecutive year, following nearly a decade of declining deadly incidents on the streets. And, distracted driving may still bear more blame than it is officially recognized for. A white paper issued by the National Safety Council last year claimed that cell phone usage behind the wheel was grossly underreported in accident investigations, and AAA’s own numbers corroborate that finding: Dashcams used by the organization to track teen driving showed distraction was a factor in nearly 58% of crashes—which is 44% higher than official government estimates. Regardless to what degree such distractions are responsible for roadway deaths, however, all parties involved can surely agree the issue is one that needs to be thoroughly addressed.